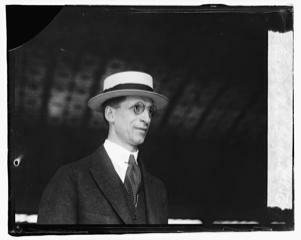 Éamon de Valera was born in New York on 14 October 1882 to Catherine Coll and Juan Vivion de Valera. Juan Vivion died when Éamon was two-years-old, and so Éamon was taken home to live in his mother’s native Limerick with his uncle (TP Coogan, De Valera: Long Fellow, Long Shadow). Due in part to his American citizenship, when Éamon was arrested for his role in the Easter Rising, his death sentence was commuted to penal servitude for life. Éamon was the only commandant to escape execution – notably, later in life, Éamon chose not to exercise the same mercy in several cases (C Wallace, Sentenced to Death: Saved from the Gallows). Éamon was released from Dartmoor prison in June 1917, and a month later he was elected as Member of Parliament for East Clare. The newly elected President of Sinn Féin, before his party’s monumental election victory in December 1918, Éamon had been arrested again in May 1918, and so was one of over 30 TDs who were marked ‘fé ghlas ag Gallaibh’ on the meeting of the first Dáil in Mansion House. In Lincoln prison, Éamon was hatching his escape plan. A devout Catholic, Éamon had access to the chaplain’s keys, and he came up with the idea of making an impression of the key from the wax of an altar candle. As the story goes, a postcard was sent to Dublin with a drawing of a key, and Michael Collins helped to bake a cake with the newly cut key inside, sent to the jail ostensibly as a gift to the prisoners. After two failed attempts, the third cake contained files as well as a key, so a master key was able to be made.